“BETCH: A SKETCH SHOW,” the all girl sketch show featuring a few of my sketches, is now live on the app, Go90. You can download the app to your phone and watch new episodes every Thursday! The show is brought to you by AwesomenessTV and stars the ladies of MADMONI and all of your favorite Viners. Check out the trailer for “Betch” after the jump. 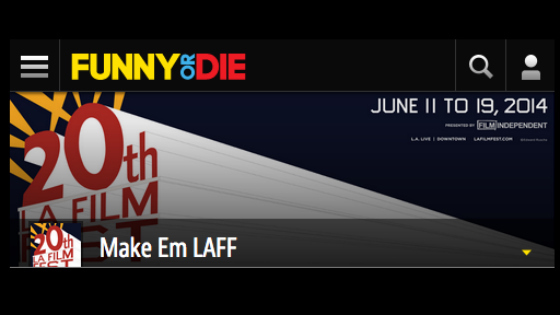 “Playing House” is being featured on Funny or Die’s homepage! It’s our third of 4 shorts to be featured on their front page. Check out the film, give us your vote and be awesome! Two short films I had the honor of Associate Producing for are being shown at the Library of Congress! See the details for the screening, which is happening tomorrow, below. Thank you to Adam Hawk Jensen for bringing me on the project. You can read the press release after the break. Olive and Mocha “Rock N Roll” is up on Youtube! The third of three new Olive and Mocha shorts, “Rock N Roll” is up on the Olive and Mocha Youtube channel. You can see it after the jump. Be cool and give us a like. Be awesome and subscribe! To find out more about Olive and Mocha, visit our website www.oliveandmocha.com. Olive & Mocha “Playing House” up on Youtube! The second of three new Olive and Mocha shorts, “Playing House” is up on the Olive and Mocha Youtube channel. You can see it after the jump. Be cool and give us a like. Be awesome and subscribe! To find out more about Olive and Mocha, visit our website www.oliveandmocha.com. ‘Olive and Mocha: Fast Times at Sugar High’ won the very first Funny or Die, Make ‘Em Laff film festival in conjunction with the LA Film Festival. As a reward Suzi Yoonessi and I were given the opportunity to produce an original short with them. The result of this partnership stars Chris Kattan and Tasha Scott (from the original Troop Beverly Hills) and can be seen after the jump. ‘Olive & Mocha’ Kickstarter reaches 175% of Funding Goal! Thank you to everyone who donated to Olive & Mocha’s Kickstarter campaign! We’ve successfully funded 175% of our goal. We will be filming all three shorts on the weekend of February 7 and 8. Stay tuned for release dates.